Diosdado Pangan Macapagal (September 28, 1910 – April 21, 1997) was the 9th President of the Republic of the Philippines, who served the country from 1961 to 1965. 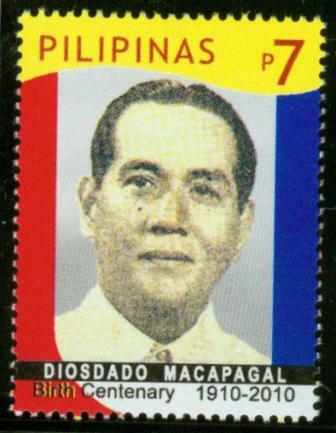 Macapagal was also the 9th Vice President (1957 to 1961). He is labeled as the Poor boy from Lubao, Champion of the Common Man and The Incorruptible. His daughter, Gloria Macapagal-Arroyo served as president of the Philippines from 2001-2010. Macapagal graduated from the University of the Philippines and University of Santo Tomas, after which he worked as a lawyer for the government. He first won election in 1949 to the House of Representatives, representing a district in his home province of Pampanga. In 1957 he became vice president in the administration of President Carlos P. Garcia, and in 1961 he defeated Garcia’s re-election bid for the presidency. As President, Macapagal worked to suppress graft and corruption and to stimulate the Philippine economy. He introduced the country’s first land reform law, placed the peso on the free currency exchange market, and liberalized foreign exchange and import controls. Many of his reforms, however, were crippled by a Congress dominated by the rival Nacionalista Party. He is also known for shifting the country’s independence day from July 4 to June 12, commemorating the day Filipino patriots declared independence from Spain in 1898. His re-election bid was defeated in 1965 by Ferdinand Marcos, whose subsequent authoritarian rule lasted 20 years.